Botox Cosmetic is a non-surgical treatment designed to reduce the fine lines and wrinkles that appear on the face over time. Also known as Botulinum Toxin Type A, it is a muscle paralyzing neurotoxin. When injected into a predetermined area, Botox will temporarily relax the muscle and smooth facial creases. There are two types of wrinkles: Static, formed by lax tissues, and Dynamic, created by repetitive muscle movements. The neurotoxin works on Dynamic wrinkles by blocking nerve stimulation to the muscles in the targeted area. As this occurs, the muscles release, easing and flattening the skin. It can provide dramatic improvement for Frown Lines (between the eyebrows), Crow’s Feet (at the corner of the eyes), Forehead Lines and Lipstick Lines (tiny wrinkles around the lips). 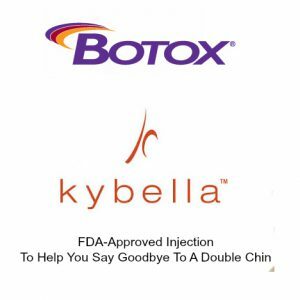 What can be expected after Botox is applied? No downtime is required after a Botox Cosmetic treatment; patients are able to return to their usual activities immediately after a treatment. Minor bruising may occur at the injection site, although this will quickly resolve. The results from a Botox Cosmetic treatment can first be appreciated in five to seven days. The full benefits from a treatment will appear in two weeks. These will last between three to four months; after which time, patients will need a repeat treatment to maintain results. Injected into the targeted area with a tiny needle, Botox Cosmetic takes less than 30 minutes in the office. Patients normally report a slight pinch during each injection. Who is an ideal candidate for Botox Cosmetic? Botox Cosmetic treatments are beneficial for men and women of any age. People frustrated by the early signs of aging due to facial lines and wrinkles, can find that Botox Cosmetic provides excellent results. Botox is safe for all ethnicities and skin types. How much will a Botox Cosmetic session cost? The exact cost of a Botox Cosmetic treatment will depend on the area being treated and the amount of correction required. At the consultation appointment, your doctor will determine how many units of Botox is required. You will find the Cosmetic Center of RI price for Botox is very inexpensive compared to other places. What are the possible risks of Botox? Botox Cosmetic is considered safe when applied by an experienced professional. Complications are rare; but should they occur may include severe headaches or over correction. How long will the results from my Botox Cosmetic last? The results from one Botox Cosmetic treatment will last between three and four months. At this time, a repeat procedure will be necessary to maintain the results. When can I return to work after my Botox injections? Patients are able to return to work or school immediately after a Botox Cosmetic treatment. What can I expect from the recovery period after Botox Cosmetic injections? There is no downtime required after a treatment with Botox Cosmetic. Minor bruising may occur; this will resolve over the next few weeks. The results from Botox Cosmetic can be fully appreciated within the next two weeks. Botox Cosmetic injections cause very little discomfort. Patients normally report a quick ‘prick’ during the injections. Will anesthesia be used during my Botox Cosmetic treatment? No anesthesia is required during a Botox Cosmetic treatment, as the procedure is relatively pain free. While it is a very natural reaction to want to see immediate results, Botox takes at least a few days to become noticeable. After your injections you can go back to work or go to social activities without anyone knowing you have had anything done. No one will be able to tell that you have had the treatment but you. Very gradually over the course of the next four to seven days the majority of our clients will see the full effect of the treatment. A small percentage of people, less than 20%, will have to wait up to two weeks for the treatment to take full effect. The area between your eyebrows may continue to improve for up to one month from your treatment as your muscle continues to relax. This is a very short amount of time for months of beautiful, wrinkle free skin. One of the most common misunderstandings made by people is the idea that facial muscles aren’t supposed to move after Botox. The goal of Botox is no wrinkles, not no movement. Although, some people may prefer to have a frozen face, we do respect and take great care in all our clients. For those who want to eliminate wrinkles and maintain movement, we can assure you that our physician will allow you to show all those important facial expressions-smile, frown, look surprised- but without wrinkles. The ideal candidate for Botox Cosmetic will be either a man or woman, seeking a more relaxed and youthful appearance. Where is the Botox treatment be performed? Botox Cosmetic injections are performed at SNAPA, 102 Smithfield ave, Pawtucket, RI 02860. How long does a Botox Cosmetic treatment take to perform? A typical Botox treatment will take less than 30 minutes to perform. Botox Cosmetic is administered through very small injections, placed directly into the targeted muscle. Botox Cosmetic will smooth wrinkles and ease fine lines by relaxing Dynamic facial muscles, those responsible for repetitive movements. The paralyzing toxin is best used for Frown Lines (between the eyes), Crow’s Feet (edges of the eyes), Forehead Lines. Botox Cosmetic is a mild neurotoxin that can dramatically improve the appearance by reducing facial lines and wrinkles. Botox – or Botulinum Toxin – temporarily paralyzes targeted muscles, causing them to relax and smooth for up to four months.